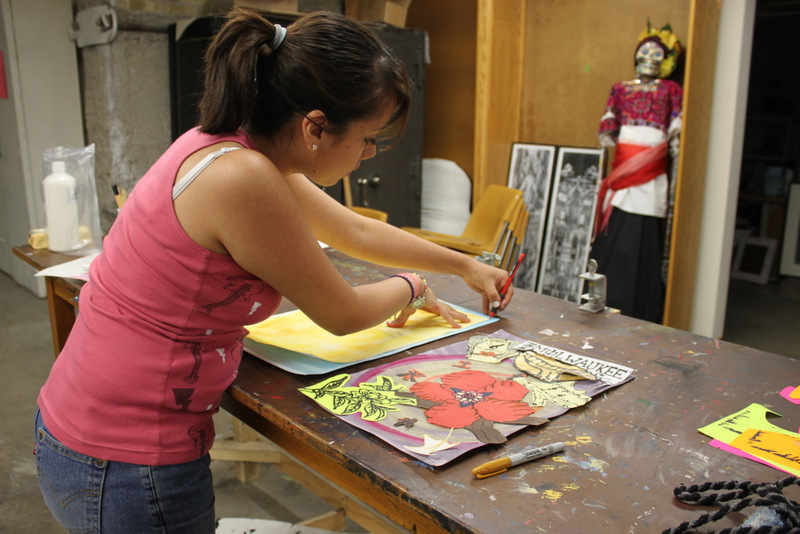 Araceli puts finishing touches on her panel for the mural. 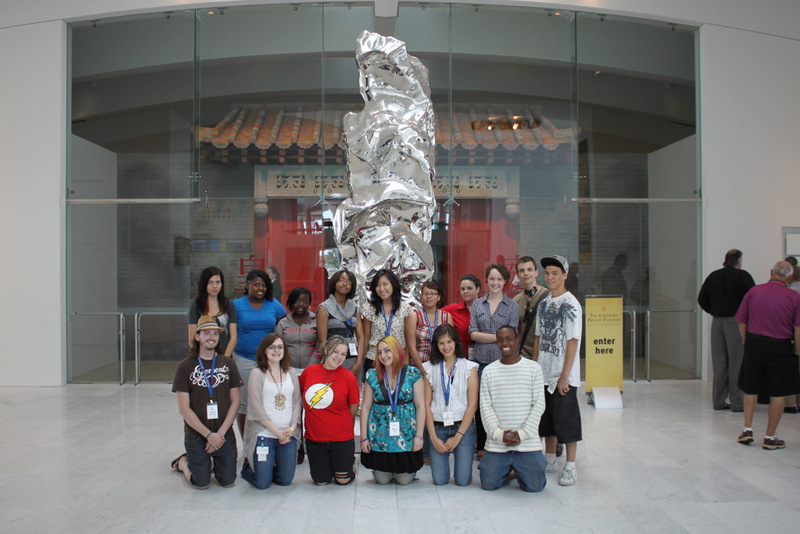 This summer, fourteen teens from all around the Milwaukee area came together for three packed weeks with a hefty task: to create a mural for the side of a Milwaukee County Transit System bus that would address an important issue in the community, inspired by themes in the Museum’s The Emperor’s Private Paradise exhibition of Chinese art. Fourteen people all work together on a project like this? On a public art piece that would be displayed for an entire year? How could adults accomplish that, they seemed to say, let alone teens? Eileen reveals her woodblock print. Well, I am pretty sure there is no age group on earth better suited to tackle such a challenge. Milwaukee teens continue to impress me at every turn. They are observant, dedicated, passionate young men and women who have a sincere desire to improve the quality of life in our city, and that is just what they’ve accomplished with this project. 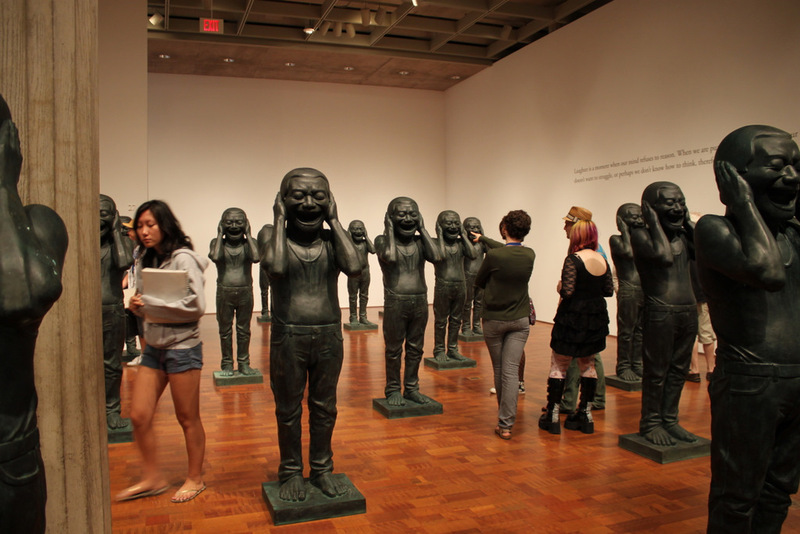 Teens explore the "Chinese Contemporary Warriors" installation by Yue Minjun. 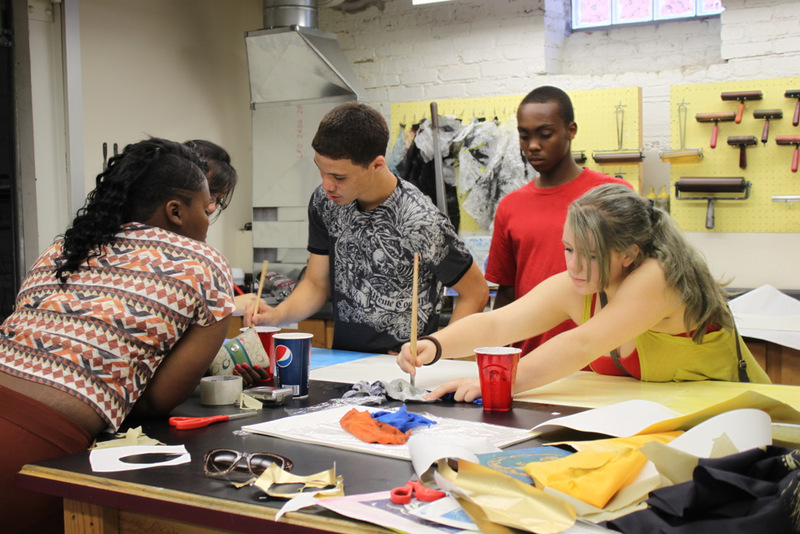 The teens worked collaboratively the whole way, guided by local artist/RedLine resident John Kowalczyk and me. We began by carefully considering The Emperor’s Private Paradise, taking time to explore the works on our own and with Laurie Winters, the coordinating curator of the exhibition, in order to understand the themes of the show. Those themes would lead us to the issue we wanted to address. 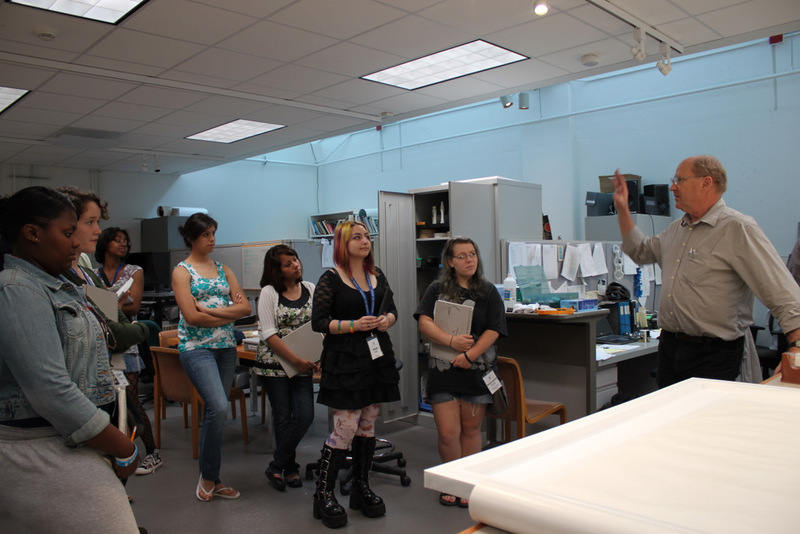 The teens visit Jim DeYoung, Senior Conservator at the Milwaukee Art Museum. The teens identified harmony as one of the key ideas in the Emperor’s Qianlong Garden–specifically the Buddhist idea that harmony and enlightenment can be attained no matter what background one comes from. This became the perfect umbrella to explore how harmony can come from even negative situations, giving them a chance to explore issues like segregation, education, politics, and class. 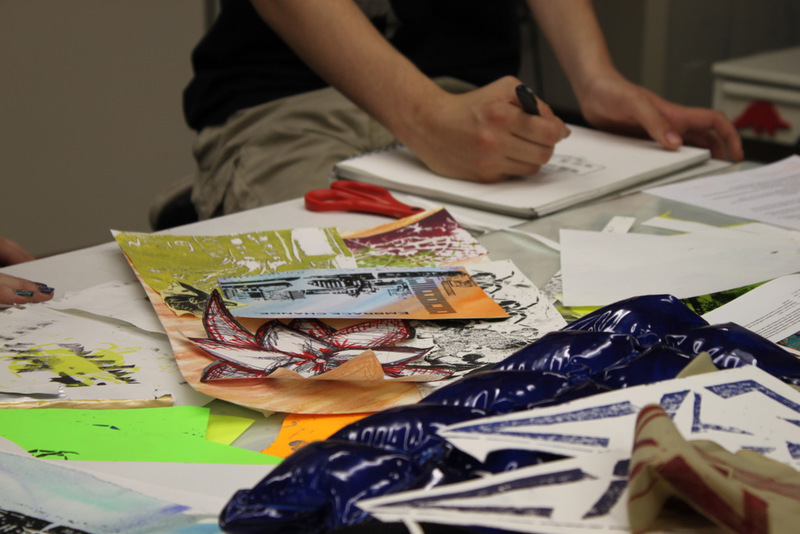 Each teen chose one issue and created a series of woodblock and silkscreen prints addressing how something positive could come out of a negative. Those prints would be collaged into a final series of panels to create the mural for the bus. In addition to working at RedLine, a community arts center in downtown Milwaukee, to create their works of art, they also spent time at the Museum (of course!) 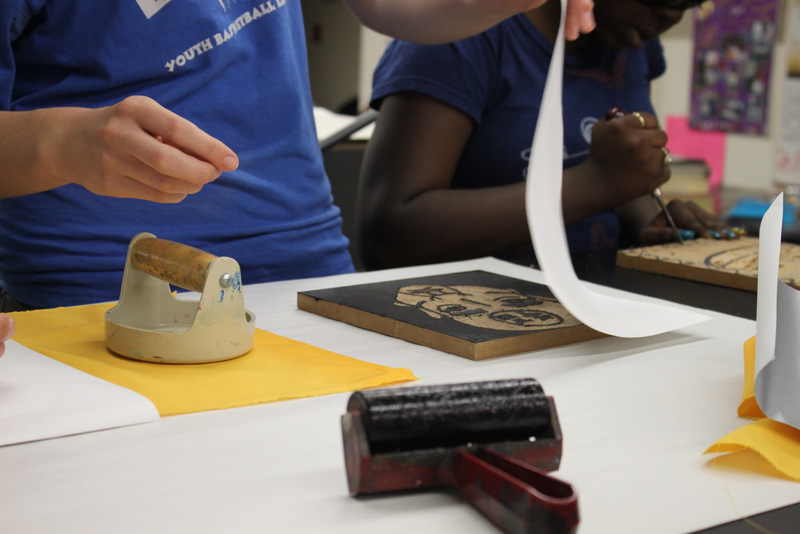 taking a behind-the-scenes look at careers in the arts as well as teaching elementary school children from Milwaukee Public Schools Community Learning Centers about the Chinese art exhibition and guiding them through a printmaking project. Sun, Eileen, Efrain, Tevonta, and Alex work together to paint the background of the mural. I can’t reveal the finished product to you quite yet–the mural has to go to the MCTS advertising company to be prepped for display on the bus!–but not to worry, there will be a follow-up post right here on the blog in October after our big unveiling and celebration. In fact, you should join us–just come on in to the Museum on Saturday, October 1, when the bus will be parked outside the famous Calatrava-addition wings all afternoon. You can even meet the artists themselves! Art Xpress 2011! Top row, from left: Alicia, Sun, Ionia, Lerys, Tina, Araceli, Yesenia, Eileen, Marco, and Efrain. Bottom row: Johnny (facilitating artist), me, Alex, Nina, Yahiranely, and Tevonta. Thanks to Michael from Visitor Services for snapping this shot! Congratulations to all the Art Xpress teens–it was an honor to work with you and be inspired by you this summer, and I know I’ll see you all at the Museum soon! This entry was posted in Behind the Scenes, Education and tagged Art Xpress, Museum education, Summer of CHINA, Teen Programs. Bookmark the permalink.